So far the only member of my family to visit Leeds has been my brother, he brought my children with him last semester for a scenic tour. Today that's set to change as my sister has announced her intention to participate in Carnage at the end of the month which should be good! Also although nothing has been finalised, my brother is also aiming to return to Leeds during half term with the children again which I'm equally excited about! The agenda for tonight was a music quiz at Nation of Shopkeepers, equipped with Shazam which is a music discovery engine and the Internet we felt that we had this one in the bag! Surprisingly this was the first time that any of us had been to the venue, it's very unique and original. 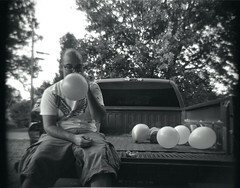 On the projection screen an array of clips were shown, people blowing up balloons made the longest lasting impression. Not sure how that fitted in with the theme, very unconventional but also engaging nonetheless! The music quiz went well, but we felt guilty using the Internet and an iPhone application to achieve success. This lead us to the conclusion that we would guess several of the final questions to appear more authentic. When the results were announced, we finished half a point away from securing a prize, with the cliche confirming that cheats never prosper!